I am organizing our Great Room - the room where we study, do crafts, create and learn. I found a collection of old cards that I inherited from various aunts. This card is particularly meaningful to me today. 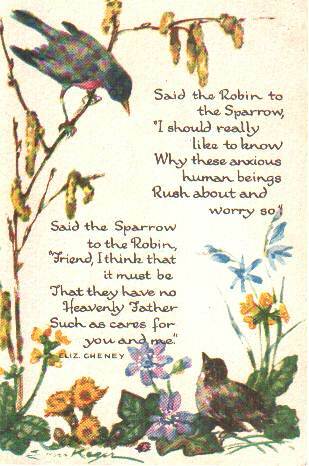 Rush about and worry so." "Look at the birds of the air; they do not sow or reap or store away in barns, and yet your heavenly Father feeds them. Are you not much more valuable than they? (Matthew 6:26)." 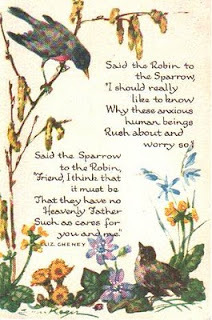 Elisabeth Elliot is worth reading on this subject: His Eye is on the Sparrow.